NOTES: Clear off your desk, then clear off a shelf, this thing is huge. The Gato submarine was considered by many to be the state of the art in submarine design at the start of the second world war. It was based on the Tambor type sub but , the Gato’s incorporated improvements that increased their combat abilities. Modifications to the diesel engines and batteries increased patrol duration over that of the earlier subs, and internal alterations provided more room for the crew. The entire class is named after the Gato itself, S.S. 212. Unlike the smaller U-boats, the Gato class had a wide patrol range, and with ten torpedo tubes, was capable of inflicting heavier damage per sub, which worked out well with current U.S. sub tactics that did not emphasize the use of so-called “wolf packs”. Whether or not WW2 American doctrine was correct is something that is still argued about by submarine enthusiasts, but the Gato (and subsequent Balao class) subs sank a total of more than 5 million tons of Japanese ships during the war, definitely delivering a hamstring that crippled the Japanese war effort. This much anticipated release makes all of the waiting worthwhile ! 266 pieces go together to make one of the largest scale submarine models available, topping out at 52”. 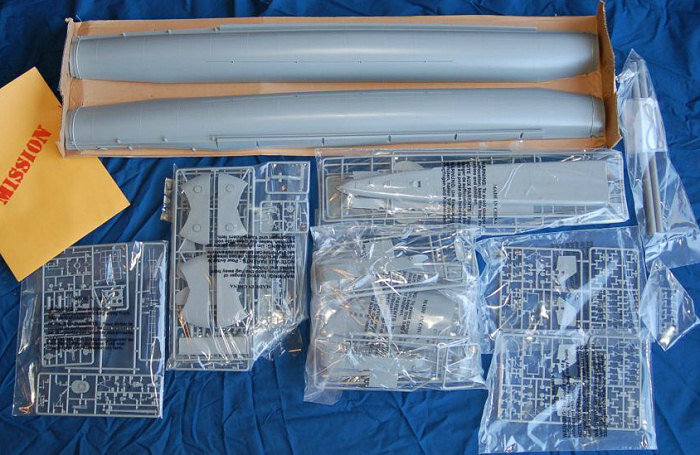 Revell listened to the modeling community, and so the packaging is much sturdier than it was for the three foot U-boat they released a few years ago. The medium gray sprues are contained in several bags, and held in place with tape and cardboard…no more broken railings! The hull is massive, and is not the standard two piece affair, but is made up of several assemblies, possibly to avoid shipping out a 52” box. Almost no flash is present on any of the moldings, and they seem to fit together quite well, I doubt this is going to be a putty monster. Another nice feature is that the holes on the sides are created open, so unlike the U-boat, you won’t have to spend hours or days drilling out every single one. It is nice to see a company listen to the modeling community, and produce such a stellar kit in such short order. This model is so striking, I expect to see quite a few on the tables of model shows, and probably a number of photos on the net…of course, with the release of the kit, look for a ton of aftermarket items in the near future also. A large decal sheet is included, including flags, and is very well registered. Oddly enough, there is also a “mission” folder that contains a “secret code” for those of us on the net to gain access to some other products for sale, such as battle patches and “vintage naval shirts”…wonder if they come with the sweat and grease-stains on them? The kit instructions are decent, very easy to understand and are quite nicely printed…not even on newsprint, this time! There are twenty one steps going into the general build, then at the end of the instructions are colour and decal guides for each individual ship, as well as some black and white photos. This should be a kit that could be built by a modeler of average skills, and superdetailer’s paradise! If you can get past the hundred dollar price tag (some online stores are selling them for a little less, but seem to always be out of stock), pick one of these up, if you haven’t already. I received a phone call five minutes after they had arrived at the local Hobby Depot, and by the time I drove there, a number had already been snapped up. Just make sure your significant other is either aware of your purchase, or is out of the house, because there is no way you are sneaking this box inside! Review kit courtesy of: A preorder with Hobby Depot of Gilbert, and my wallet.